Having previously reviewed a number of Bob Lum’s creations (including the Spyderco Lum Tanto and the Benchmade Onslaught) I have always enjoyed Lum’s elegant approach to designing knives. The Lum Chinese Folder is no different, and in some ways it is even more special than his other designs. To start, I love the sheer simplicity of this knife. The Chinese Folder is a single graceful curve in the both open and closed positions. There is a real feeling of balance with this design, and it results in a knife that is both a pleasure to view and to hold. Spyderco has released many versions of the Chinese Folder over the years, but what you are looking at in this review is one of the original versions of the knife, manufactured in 2000. Furthermore, this knife has been serialized. That designates it as part of Spyderco’s first manufacturing run, also known as a Spyderco “Collector’s Club” knife. So what we have here is a very special version of the Lum Chinese, and I couldn’t be more pleased to share it with you. The Lum Chinese has an overall length of 7-3/16 inches, features a 3-5/32 inch blade, and weighs a mere 2.8 ounces. The Chinese Folder could work as an EDC knife, a gentleman’s folder, or simply a collectible. Either way the size-to-weight ratio of the knife is pretty wild. A sub 3-ounce carry weight on this relatively large and sturdy knife is incredible. And I have to say, the Chinese folder feels impossibly light in hand. If this all sounds a little too delicate, Spyderco also makes a large version coming in at a beefier 4.3 ounces. The blade of the Chinese Folder is often referred to as “leaf shaped.” What we have here is a graceful arcing blade that has been given a full flat grind, and a very small swedge running pretty much the entire length of the spine. This is not only a pretty blade to look at, but it is highly functional as well. The Lum Chinese is an exceptional slicer with its full grind and 3mm thin blade. Speaking of thin, this blade is very thin behind the edge, and is a big part of what makes the knife cut so well. My Lum Chinese is made in Seki City, Japan and features Japanese VG-10 for the blade. A stainless steel, VG-10 is easy to sharpen and is capable of taking a razor sharp edge. It is also highly resistant to corrosion. I am a big fan of VG-10, and think it is a natural choice for the Lum Chinese. Fans of higher performance steel may be interested to learn that the Lum Chinese has also been previously offered in ZDP 189 as well. The handle on my Chinese Folder is aluminum, and has been given a green almite coating. Almite is simply a type of finish for aluminum (like hard anodizing). Over the years Spyderco has released the Chinese Folder in a number of different handle materials including carbon fiber, various colors of aluminum, titanium, and G10. I happen to really like the dark green color of this knife. It’s a deep green, and from a collector’s perspective I find the unique color to be extremely intriguing. As for actual construction, my knife is screwed together. There is a black G10 backspacer, and a single steel liner. Overall, construction is lightweight, but solid. In hand the Lum Chinese fits surprisingly well, but is not without it’s caveats. The curvature of the handle matches the contours of my palm and the knife is quite comfortable to hold. Despite this, I wouldn’t recommend the Chinese Folder for anything beyond medium duty. The aluminum handles are somewhat slippery and there is no thumb ramp, finger choil, or any kind of jimping. For light to medium use I think the ergonomics are quite alright, but lets be honest – this isn’t a knife you will want to take to war, or be in your pocket aboard a commercial fishing boat. I really don’t mind that as the knife market is already well saturated with those kinds of knives. The pocket clip is a simple stainless steel Spyderco clip. It offers good retention and makes the knife easy to insert and remove from your pocket. For carry options you have the choice of right side tip-up or tip-down carry. All-in-all I really like the way the Lum Chinese carries, it’s extremely light and very thin. This is a knife you will forget is in your pocket. The Chinese Folder features a 12mm thumb hole that is easily accessible from either side of the knife. The Chinese isn’t the fastest deploying knife in my collection, but it opens easily and feels very smooth. Thin phosphor bronze washers aid in deployment. The Lum Chinese has a thin linerlock and it snaps open crisply. It’s a very satisfying sound from such a small knife. Lock engagement is early, and I detected no zero blade play. I know that the somewhat thin liner lock will disappoint some, but given the intended use I have found it to be quite adequate. The Lum Chinese is a graceful knife that is a delight for all the senses. I have greatly enjoyed mine, and spend a fair amount of time admiring the clean lines, the beautiful handles, and the crisp action. The knife works, and it will certainly cut, but the form-over-function approach to the ergonomics keeps this knife from becoming a real user for me. That doesn’t mean I don’t like the knife, but I just want to “keep it real.” If I had to pick one EDC knife to take to the grave, then the Lum Chinese wouldn’t be it. But if I was looking to add an elegant and unique Spyderco to my collection, well, I’d be all over this one. I feel that the Chinese Folder is a very special knife, and it has been an absolute pleasure to spend some time with this gem of a folder. At the time of this review the Lum Chinese Folder can be had in both a carbon fiber version and a large version in black G10. If you really like the knife then I recommend picking up a couple – like my original green-handled beauty, you never know when the knife might slip out of production. I recommend purchasing the Lum Chinese Folder at Amazon or BladeHQ . Please consider that purchasing anything through any of the links on this website helps support BladeReviews.com, and keeps the site going. As always, any and all support is greatly appreciated. Thank you very much. The Spyderco Dragonfly 2 is a knife that, frankly, I didn’t think I would like. As far as every day carry goes, I’m into medium to large size folders. Maybe it’s a macho thing, I really don’t know, but I just felt like I would be under-equipped with a small knife and I really like having a full 4 finger grip. So the thought of packing a massive 5-7/16″ knife with me that weighs a whopping 1.2 ounces wasn’t super appealing. That is, until I got my hands on the knife. It took me about 2 seconds to realize how badly I had underestimated this little knife, so lets give this awesome EDC blade the full run down in my written (and video) review. The Dragonfly has a 2-5/16″ blade, an overall length of 5-7/16″ and a weight of just 1.2 ounces. You hear about knives that just “disappear” into the pocket and that you forget about carrying – well, this one really is. I love this thing for EDC, it’s perfect for almost any kind of urban environment and it’s got a big enough blade (and more importantly, a comfortable enough handle) for most EDC tasks. The blade on this knife is a beautiful little leaf shape, and kind of aggressive looking with a very fine tip. To me, the blade almost resembles a dart. The small swedge running across the top softens the feel of the spine and the whole blade has been given a full flat grind. There is adequate belly and an excellent tip. This blade excels at opening mail and packages. This knife was made in Japan and like many of Spyderco’s Japanese production knives this one features VG-10 blade steel. VG-10 is a great choice as it holds a good edge and is capable of getting extremely sharp. No complaints with the VG-10 version but the ZDP-189 version is even better with its amazing edge retention qualities. I’d highly consider the upgrade to ZDP-189 if your budget can handle it, but I’ve found VG-10 to be entirely adequate for my purposes. The handle on the Dragonfly is made of fiberglass reinforced nylon (FRN) and is covered in Spyderco’s bi-directional texturing. This is the same kind of texturing found on both the Delica and Endura and I find that it offers exceptional grip in both wet and dry situations. Unlike the Delica and Endura, the Dragonfly does not have stainless steel liners. That is not a problem for me because the handle feels plenty strong and it is a big part of the reason why this knife weighs so little. Fans of G10 and steel can rejoice because Spyderco also makes a G10 version. All in all handle construction is solid, I like that they used screws for easy take down and everything feels very well finished. Ergonomics is where we really start to see this little knife shine. Most smaller blades suffer from poor ergonomics and get kicked out of my pocket pretty quickly. The Dragonfly has extremely refined ergonomics and squeezes big grip out of a small knife. First of all, you have a 50/50 choil and large thumb ramp. Both have been given a large amount of jimping. I am a huge fan of 50/50 choils, it really can transform the way a knife handles and what it’s done for the Dragonfly is no exception. But perhaps my favorite ergonomic feature is the way the back end of the handle has been shaped to support the pinky finger. This gives you a true 4 finger grip and allows for awesome leverage on the knife. In my mind, this little section of FRN is what really makes the Dragonfly work. The pocket clip is another home run. This is a Spyderco wire clip and is perhaps my favorite pocket clip design of all time (really). Small, but very secure, this little piece of hardened steel gives you a deep and reliable carry. The handle has been designed to allows for ambidextrous tip up carry. My only suggestion would be to anodize it black like on my Sage 1 – then it would be virtually invisible riding in a pair of blue jeans or dress pants. The Dragonfly takes advantage of a 11 mm Spyder-hole. This is a good size for the knife and has been left kind of sharp, which ensures that you thumb will catch on it every time. Deployment is smooth and reliable and you can easily flick this knife open if you like. I have zero complaints with the deployment. Lockup is achieved through a small lock-back positioned in the middle of the handle. I like the lock-back on this knife, it’s easy to get too and the spring isn’t too heavy. The lock-back makes this a fully ambidextrous knife as well (always a plus – especially when a lefty is writing the review). Lockup is rock solid on the FRN version, with zero play in any direction. This has been the story of the little knife that could. I seriously have nothing bad to say about the Dragonfly. I am totally impressed by how well this thing works as an EDC blade. Since it weighs nothing I also like pairing this with a larger tactical folder; that way I always have the right tool for the job. Perhaps the only downside is the price. With a price tag hovering in the $50 range, you are looking at Delica (and almost Endura) territory. Some might have a hard time justifying spending that kind of money on such a small knife, especially given the rest of Spyderco’s product line. However, I love my Dragonfly II and it has remained one of my all time favorite EDC knives. It is hard to beat this small, lightweight package for daily carry. The knife is imminently useful when you need it, but disappears into your pocket. It has stood the test of time for me, and easily makes my best edc knives list. For fans of Spyderco and ultra lightweight EDC knives, the Dragonfly II is a no-brainer. 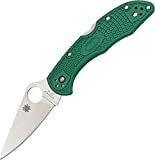 If you would like to buy a Spyderco Dragonfly II, I recommend purchasing it at Amazon.com or BladeHQ. Please consider that buying anything through any of the links on this website helps support BladeReviews.com, and keeps the site going. As always, any and all support is greatly appreciated. Thank you very much. Ah, the Spyderco Delica – is there a more classic EDC design? Well, if we are talking about modern folding knives, I’d argue there really isn’t. One of Spyderco’s most popular knives, the Delica 4, is the brand’s bread and butter; a simple, reliable folding knife that is built with easy carry and utility in mind. Many will wonder why it took me so long to review the Delica. Even the relatively new fourth generation version (hence Delica “4”) has been out for a while. The truth is, there are too many knives and too little time. Also, I reviewed the Endura 4 a while back, and since the knives are so similar it took me a while to get around to the Delica. Better late than never however, and I finally intend to give this knife the attention it deserves. The Delica has an overall length of 7-1/8″, a 2-7/8″ blade, weighs 2.5 ounces, and is made in Japan. This is a slim and lightweight design, perfect for every day carry (EDC). The Delica features a leaf shaped blade, and is defined by its large thumb hole. This is a classic Spyderco blade shape. For the uninitiated the blade will almost look goofy, but for those that appreciate this unique aesthetic it’s a beautiful sight to behold. The 4th generation has been given a full flat grind and a beautiful satin finish. All in all, it’s a pretty unremarkable blade, just a simple look that is designed for performance. The tip is fine and lacks reinforcement so the user needs to take care and avoid any prying tasks. The standard Delica comes with a VG-10 blade. VG-10 is a Japanese stainless steel. This is a serviceable mid range steel. It’s easy to sharpen, takes a fine edge, and holds on to it for a reasonable amount of time. It’s not a super steel, but it’s a step above budget blade steels like AUS-8 and 8Cr13MoV. The handle on the 4th gen is fiberglass reinforced nylon (FRN) over full stainless steel liners. The liners have been nested inside the scales and are thoroughly milled out. This keeps the knife very slim and lightweight. Everything has been bolted together so you can take the knife apart if needed. Since the Delica has a backlock, this is a closed back design. You can get the Delica 4 in a variety of colors including blue, purple, brown, white, green and of course black. Collectors like this, and I admit the choice of color is fun. I went with green for mine, it’s a friendly color that stands out from the sea of black handled knives in my dresser drawer. The ergonomics on the latest generation of the Delica are quite nice. This is no surprise for a design that has spent over 20 years in the Spyderco catalog. That said, there have been a number of refinements to improve the already solid foundation. The FRN scales have been given what Spyderco calls a “bi-directional texture” – this allows for a slip resistant grip at any angle. Jimping extends from the back of the handle to the top of the thumb ramp, and it locks the thumb in nicely. The handle shape is smoothed on the edges and has plenty of room for large hands. This handle is very comfortable in all the normal grips. The pocket clip is discrete and offers unparalleled carry options. This is a standard “spoon” style pocket clip and has been coated flat black. This is a removable clip and can be positioned on any of the 4 corners of the knife with 3 torx screws. I love the versatility of this clip, this is a truly ambidextrous design. Clip retention is excellent and the knife rides low in the pocket. The only negative I could find is that the coating does wear off with use, which happens with pretty much any pocket clip. It should be no surprise that the Delica uses a thumb hole for deployment. This particular spyderhole has a diameter of 13mm. I have found this to be a good size for both gloved and bare hands. Deployment is smooth and the knife can be flicked out with a practiced hand. The Delica uses a back lock located right in the middle of the handle. This is easy to access but it will take some technique to close this knife with one hand. The lock is very secure with no blade play at all. The spring on the back lock is very good so inadvertently opening the knife is highly unlikely. The Boyd dent on the lock bar helps ensure that the knife will not inadvertently close either. It doesn’t take long to discover why this is one of Spyderco’s most popular designs. One thing that strikes me is how well built the knife feels. The nested liners are flush, the blade is centered, the FRN is well finished. I love the satin finished blade and shaving sharp edge. I also can appreciate how lefty-friendly this knife is. The thumb hole, lock back and pocket clip are entirely ambidextrous. Add in the choice of colors and this really feels like a knife that was made for me. As I struggle to find negatives about the knife, I’ll mention that at around $65, it is not a cheap knife. Especially if you are considering this as a step up from $20-30 knives. I think you get what you pay for. I would also say that it would be really nice if they made the Delica in America. These are really minor issues, and if its the worst thing I can say about the knife then it really says something. In conclusion, the Spyderco Delica is an outstanding knife. It has been refined over decades and has become a measuring stick in the EDC knife world. If you are on the road to collecting pocket knives, the Delica 4 is a foundation blade. If you are simply looking for a practical EDC knife, then the Delica 4 fits that bill too. If you would like to buy a Spyderco Delica 4, I recommend purchasing it at Amazon.com or BladeHQ. Please consider that buying anything through any of the links on this website helps support BladeReviews.com, and keeps the site going. As always, any and all support is greatly appreciated. Thank you very much. I recently acquired a Spyderco Bob Lum Tanto. This is a sprint run (limited edition) knife limited to around 700 pieces. It’s a pretty unique offering designed by custom maker Bob Lum. As you probably know, Bob recently passed away (RIP) and so this knife is very special for many reasons. In addition to being a limited edition run, the Lum has a tanto, which is a very uncommon blade shape for Spyderco. I absolutely love the simple lines and minimalistic look of this knife. I am very excited to share this unique Spyderco knife with you today. Being a limited edition knife, I get the feeling that most (myself included) will simply collect it. For many that will be the primary purpose. This is almost sad because what we have here is simply a wicked tactical folder. If you can bring yourself to use it, I see the Lum Tanto providing a ton of utility for it’s owner as a utility knife, or perhaps as an emergency defensive item. I’ll be reviewing the blade from a both a collectable and large EDC knife perspective. The Lum has a 3-7/8″ blade, an overall length of 8-3/4″ and a weight of 4.3 ounces. It’s a large and solid folding knife. This knife was made in Seki City Japan and has many of the details that I love from Spyerco’s Japanese knives. The blade is on the Tanto is very impressive, made of an ultra thick piece of VG-10 steel. The blade is 1/8″ of an inch thick and due to the tanto blade shape, it holds this thickness for most of the blade’s length. Of course by now you know it has a tanto shaped blade, but what we have here is a more traditional, slightly curved tanto rather than the boxier American tanto. The blade is hollow ground about half way up and is given a combo grind. The knife starts out with a traditional V-grind that transitions into a convex grind once you get to the tip further enhancing strength and piercing power. Out of the box this knife was incredibly sharp. I love the grinds on this knife, it’s a beautiful polished blade that appears to glow under the light. VG-10 is of course a Japanese steel. It is a hard steel that is among my favorites because it takes an awesome edge. The gray G10 handle sets this knife apart. Spyderco previously released an all black version of the knife (in another Sprint run) which was very cool. The gray version is equally impressive (if not greater – I love the uncoated steel, this blade is too pretty to coat in my opinion). Unfortunately, the gray G10 gets dirty very easily. If I used this knife regularly, I would complain, but as a collectable I can set that gripe aside and appreciate that Spyderco wanted to make this knife unique. The handle has full stainless steel liners, and on the non-locking side they have been milled out to reduce weight. The ergonomics on the Lum Tanto are good, mainly because we have such a large handle here. I have ample room for my 5 fat fingers and if I set my hand back on the blade I’ve got an extra inch of reach. Alternatively, you can choke up and make use of the large thumb ramp. There is no jimping, but the big thumb ramp makes it almost unnecessary (especially as a collector’s piece). Finally, the gray G10 is among the grippiest I have ever felt. The level of traction puts my Military to shame and almost feels like shark skin – my fingers just lock in place. It’s wonderful stuff. The pocket clip is a pretty standard Spyderco clip. It’s mounted for right hand tip up carry only. It’s been placed near the center of the handle and isn’t designed for particularly deep carry. I feel like this knife wasn’t really designed with carry in mind. To be perfectly honest, I’m kind of glad Spyderco didn’t drill extra holes all over the knife, instead deciding to go with a cleaner look. Being a Spyderco, naturally this knife has a thumb hole for deployment. The Lum Tanto uses a 12mm Spyderhole which is adequately sized and easily accessible on both sides of the knife. This knife uses white teflon washers rather than phosphor bronze washers. What this does is make for incredibly smooth deployment. It’s difficult to describe so let me say it’s “very very” smooth. As for speed of deployment, this is not a knife I flick open, the heavy blade makes that difficult. The Lum Tanto makes use of a solid liner lock. There is no play at all when this thing is engaged and lockup is nice and early. This is a nice sturdy lock that rounds out a very nice knife. Well, what is there to say? Really I’m sure anyone interested in this knife didn’t need to read my review to figure out that this thing is awesome (but I hope you enjoyed the pictures). I fell in love with this knife at first sight. All in all, I am very happy with it. My blade is slightly off-center. Not a deal breaker, but for a knife with a $250 MSRP I have to mention that. In conclusion, this is just a sweet collectable and potentially a very effective tactical knife. I love the overall aesthetics, the ridiculously thick blade, the grippy G10 and solid construction. If you can get your hands on a Lum Tanto, I totally recommend it. These are no longer being sold however I have noticed that BladeHQ sometimes gets one or two back in stock. From big to small, I review them all. That little jingle may be pretty lame, but it is also pretty true. My last review was of the ESEE Junglas, 16 inches of high carbon steel. Worth a look if want a knife that you can strap to your back and enter the breach with. Today’s topic is on the other end of the spectrum, a feather light folder by Al Mar knives. This is my first Al Mar knife review, and it’s a company I have had in my sights for a while now. For those unfamiliar with Al Mar, there is actually a long and rich history that could become an article of its own. In a couple sentences, Al Mar was the head of knife design for Gerber, and served in that position for over 10 years. Al then formed his own company in 1979, Al Mar Knives. The knives are made in Seki City, Japan and follow that area’s rich tradition of knife and sword making. Al Mar died in 1992, but the company is still producing knives to this day. The Al Mar Hawk is the smallest knife in their series of traditional folders, and has some interesting quirks that are worth mentioning. Well built and hand finished, the details are what make this knife enduring, for better or for worse. If you are looking for something ultralight and a little different, the Hawk could be just the ticket. The Al Mar Hawk is a special little knife, and for many, it serves a special purpose. A quintessential “gentleman’s folder,” the Hawk could make a discrete and stylish companion anywhere from the grocery store to a black tie event. It is certainly a good choice for the office, as it is about as inconspicuous and people friendly as knives get. It could also serve as an EDC blade (or backup EDC blade) for those looking for something lightweight and high quality. It also a knife that appeals to collectors. I find it to be a handsome little blade that could easily be kept in my desk or dresser and admired (and perhaps even used) from time to time. The Al Mar Hawk has a 3.25 inch handle, with a 2.75 inch blade and an overall length of 6 inches. This is among the lightest knives I have handled, weighing in just under an ounce. This knife disappears into pockets and is literally a knife that you will forget you are carrying. The blade, like the rest of the knife, is slender and understated. It is made of relatively thin stock, which combined with a flat grind makes it a phenomenal slicer. It features a simple drop point shape and is made from AUS-8 steel. AUS-8 isn’t a “wundersteele” by any stretch of the imagination, but again, you have to understand that this is a Japanese knife, made with a Japanese steel and certain traditions and eccentricities are part of what makes the knife special. In today’s world of high end super steels, now might be a good time to remind you that AUS-8 is by no means a bad steel. I find it takes a very sharp edge although it may not hold that edge as long as say, VG-10, another Japanese steel. The handle of the Al Mar Hawk is simple and elegant with it’s pair of piano black linen micarta scales. The hand rubbed micarta is smooth, but not slippery, providing a pleasant feel. The handle is punctuated by flush mounted nickle silver rivets given an almost mirror-polish. There are no liners or bolsters, which is part of the reason why this knife is so lightweight. Despite this omission the handle feels solid and secure, with a stainless steel lock back bar running the length of the handle. Another feature absent from the Hawk is a pocket clip. For such a small knife, it hardly seems necessary, and in fact it may be somewhat offensive to have a clip hanging off of the otherwise svelte lines of this little folder. If a pocket clip is a “must have,” consider upgrading to the slightly larger Eagle or Falcon models. The clips are very nice with a black coating and red Al Mar logo. The Hawk does have a lanyard hole, which could aid in retrieval. The ergonomics of the Hawk are surprisingly pleasant for such a small design. The knife fits comfortably in hand and I have no complaints. There is no jimping, thumb ramp or choil, so as for aggressive use, you will probably want to carry another knife. For the knife’s purpose I think the current configuration it works just fine. The Hawk utilizes a couple good sized thumb studs to facilitate easy deployment. The pivot point on this knife isn’t adjustable (in fact, the entire knife is riveted together), but due to the high level of quality control, you can be certain that the knife will come well tuned from the factory. The deployment starts off on the stiff side, but after some use the knife will break in and you will find that the blade deploys smoothly, and can be flicked out if necessary. The Hawk uses a lock-back mechanism, located near the front of the knife. This is another classic design element and it holds the blade securely in place. Of course, from such a small and lightweight knife will have its disadvantages and one is that the lock is not particularly strong. For light EDC tasks that you would expect to do with a gentleman’s folder or dress knife, the Hawk will serve admirably. While there isn’t any play in the knife, the liner-less design lends itself to some flex. Don’t expect to chop down a tree or use the knife as a crow bar and I think you will be satisfied with the lock’s performance. At the time of this article, the Hawk is hovering around $100. That isn’t cheap for a little knife. That said, it is very well built, made in Japan, hand finished, etc – in may ways you get what you pay for. The materials are good, but for the money I’d love to see VG-10 in place of the AUS-8. Also, I wouldn’t complain if they could squeeze a pocket clip on there (you could always take it off). It goes without saying that you are also paying for exclusivity. It adds just a touch of class to your every day gear, any few people will have it, let alone recognize what it is. So I would conclude that as far as value goes, this knife is definitely more of a luxury item than a high value item. But, if you like fine knives, or don’t want to look like an evil knife guy on your next trip to the water cooler, the Hawk could be an easily justified purchase that will provide years of service and enjoyment. 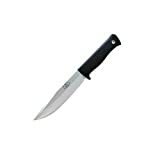 If you are thinking of buying an Al Mar Hawk, please consider purchasing it at Amazon or BladeHQ . By purchasing things through any of the links on this website you support BladeReviews.com, keep the website free of annoying banner ads, and help produce future reviews. Thank you very much. Photo Credits: Many thanks to Bernard of EveryDay-Carry.com for the exceptional pictures of the Al Mar Hawk. For those who are curious (and I know I was) the watch is a Seiko SRP027K1 and the Spyderco pictured is a Leafstorm that Bernard has modified by dying the handle black. If you didn’t already know, Bernard is a fellow gear and knife nut and he runs an endlessly entertaining blog on EDC options. It was really cool of him to let me feature his photography – thanks again!